I chose to use a CNC (Computer Numeric Control) router to make this project because it gives me the capability to deliver a much more personalized product with a higher degree of accuracy and faster speed than anything produced by hand with a router. After the first rulers were completed, I was bit by the CNC bug and decided to learn and practice as much as I could. I joined the closest TechShop three and a half hours away in Austin, TX and spent hours at a time experimenting with different techniques, processes and designs for the growth rulers. Claymark® uses only the finest New Zealand-grown radiata pine, from carefully managed and certified plantation forests to produce premium class solid pine boards. 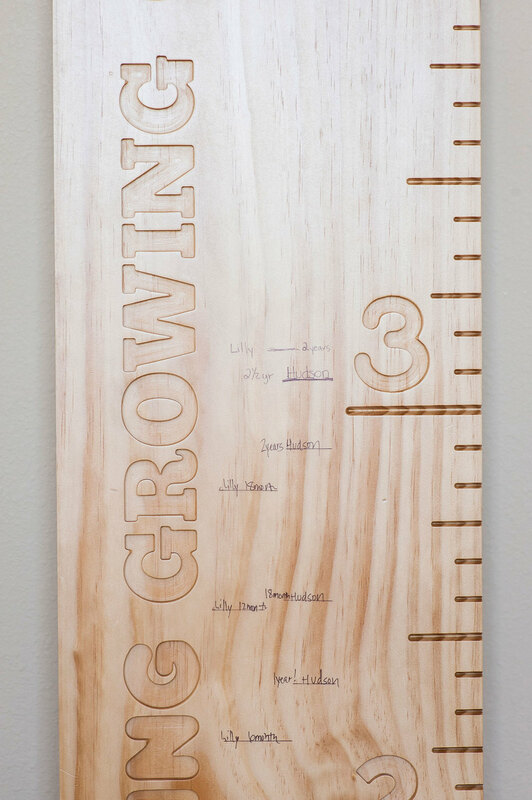 My wife and her father chose this wood to make our first growth ruler and I have used it ever since. During the routing process, the pine keeps a crisp edge and has minimal tear out. It looks beautiful before or after finishing and has a wonderful grain. Columbia's soy-based Purebond plywood panels are comprised of no added urea formaldehyde components and assembled with zero urea formaldehyde adhesives which makes it one of the best plywoods on the market. Additionally, it outperforms UF bonded panels in all moisture degradation tests, making it more longer lasting than other plywood one the market. 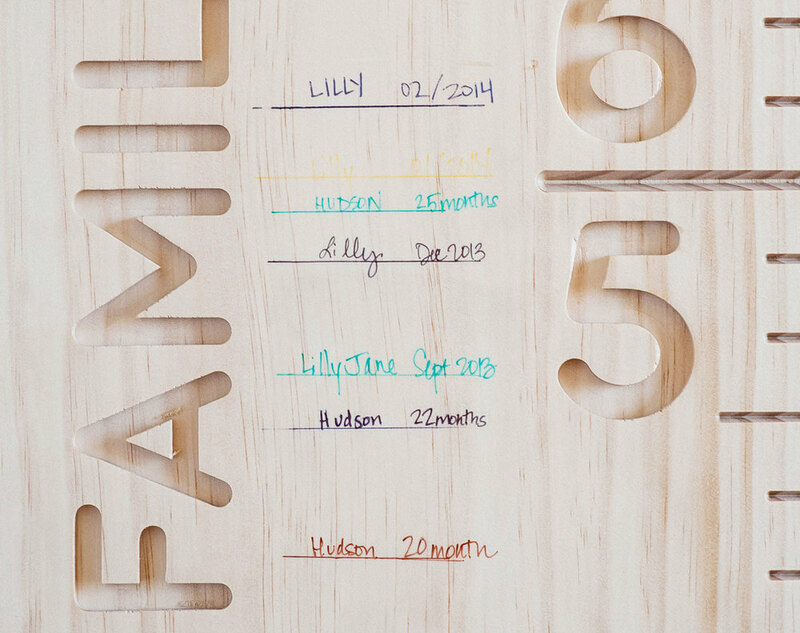 Like the radiata pine wood, this plywood keeps a crisp edge and has minimal tear out during the CNC routing process. Both the face and back of the plywood I am planning on purchasing will be very high quality - A1 (plywood faces come in 6 different grades: AA - E, and 4 different back grades: 1-4). However, the middle layers will be of lesser quality, meaning there might be visible defects such as knots, mineral streaks or gum spots. These defects do not take effect the strength of the board. I consider them to be a beautiful and natural part of the wood but want to disclose their presence nonetheless. After some experimentation, I selected three fonts that were simple, yet had distinct personality and looked good after being routed into the boards. Valtec's Ultra Low VOC Self Seal Pre-Catalyzed Lacquer can be added to your ruler to ensure that it lasts a long time. As shown in the above picture, the lacquer enhances the grain of the wood with a glass smooth, matte finish. The lacquer is formulated for excellent durability and provides enhanced UV protection with excellent mar, water, solvent and general chemical resistance. Professional refinishers use this product for cabinets, fine furniture, and other interior wood surfaces that require a durable, long lasting finish. Several different markers and pens were tested on the lacquer finish. The best results came from colored ultra fine point Sharpie permanent markers. Ballpoint pens also worked well. After writing, the ink from both types dried quickly without any smearing.